Ven. 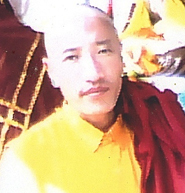 Khenpo Jampal Dorjee was born in Kham Riwoche, Eastern Tibet in 1980. At age 8 he was taught to read and write by his parents. Later he studied at Taklung Kagyu Riwoche Great Monastery's school and became a monk when he was 13. He took his monastic vows under His Eminence Choktul Tenzin Gyaltsen Ngawang Mawai Nyima Rinpoche and studied under the tutelage of Venerable Gen Sonam Tashi. He spent the next ten years at Riwoche Shedra College and studied Buddhism under Ven. Khenchen Sherab Palzang Rinpoche and Ven. Khenchen Karma Tsultrim Ripoche. He also taught junior monks in the Shedra College. He has received many ripening empowerments, liberating instructions, supporting oral transmissions and Taklung Kagyu Lineage teachings from H.H.Kyabgon Taklung Tsepha Rinpoche, H.E Choktul Tenzin Gyaltsen Ngawang Mawai Nyima Rinpoche, Ven. Khenchen Sherab Palzang Rinpoche, Lobpen Tsepak Namgyal and Dorjee Lobpen. At age 24, on the orders of Ven. Khenchen Karma Tsultrim Rinpoche, he went to Lhasa to further his studies on medicine, astrology, astronomy-science and higher grammar at the Tibetan Medical University. His teachers included Medical Professor Ven. Khenchen Troru Tsenam Rinpoche, astrology Professor Jampa Trinley and Professor Kunga Rigzin. After his studies, he went back to Riwoche Great Monastery and taught astrology and astronomy to the monks at Riwoche Shedra. He was later bestowed the title of "Khenpo" by the High Masters of Riwoche Great Monastery. Thereafter, he went on a pilgrimage around Tibet. At the same time, he received many teachings including the Mahamudra from Venerable Yogi Yanga. At 2007 he went to India to try to further his studies at an established Buddhist university. However, he did not get the chance due mainly to financial problems. He is currently studying in Sherab Gyatsl Ling School and is also the school editor. When opportunities arose, he received teachings from His Holiness The Dalai Lama. His aspiration is to be able to continue his studies, widen and share his knowledge with everyone. He hopes to learn English to be able to propagate the Dharma to as many people as possible. He hopes every being will be enlightened just like the Buddha.